We're both reviewing this one today, so this post is going to be quite long. We had both wanted to reread the previous Mortal Instruments books before reading City of Lost Souls, but we just didn't have the time. When we have the chance to read the first four books again, we'll post reviews for them then. To Sum It Up: Although the demon Lilith has been defeated, Jace and Sebastian are missing. When the search for the boys proves fruitless, the Clave moves on to what it considers issues of higher priority, forcing Clary and her friends to take matters into their own hands. At last, Jace comes looking for Clary, and she is horrified to learn that Lilith’s ritual has bound him and Sebastian together. Harm one, hurt the other; kill one, the other dies as well. Not only that, but Jace is also under Sebastian’s control, a pawn in the latter’s plans to destroy the Shadowhunters. While Isabelle, Alec, Magnus, and Simon work feverishly to find a way to break the connection, Clary flies solo with a dangerous plan of her own to bring back the Jace she loves. 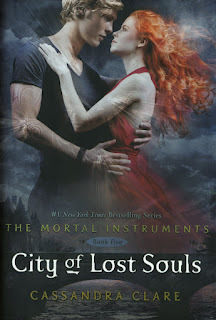 Ally's Review: In one word, City of Lost Souls was epic. And when I say “epic,” I don’t mean the version of “epic” that’s used nowadays where every little thing is mind-blowing. No! This is Shadowhunter epic! What can I say? Cassandra Clare did it again. City of Lost Souls picks up where the last book left off. Jace is missing and the gang is out to find him. I liked this book a lot better than the last book, City of Fallen Angels. To me this book just flowed better and it was more interesting. I think I could have done without reading the other book and just jumped to City of Lost Souls. I loved all the different characters and POVs, except Maia and Jordan; I could've done without them. Although I appreciated their help in finding Jace and all, I felt that they took away from the story. I liked reading about Isabelle and Simon as well. I think they are good for each other, and I'm looking forward to seeing their relationship develop. I thought the relationship between Sebastian and Jace was great! I was chuckling nonstop. Sebastian may be a deranged creep, but he is funny. I also thought that he was really misunderstood. I get that Sebastian is supposed to be evil and all, but what do you expect?! His parents showed him no love. I don't blame him for being a little twisted; I just think he needs some help. And I do think he truly did enjoy having a friend in Jace even though it was completely fake. Ahhh, let's move on to Alec and Magnus! I love, love, loved that Alec had a POV! It was so cool to see Magnus through Alec's eyes and to see what their relationship was like. I just think that they are so sweet together! Awww, I love them! I love Magnus! Ally, stay focused! But, Alec, on the other hand, was always a little sketchy to me. He just always seemed so brooding, but now that I've read more about him I think I can understand him better. I mean, what's not to like? He looks like Will and he's pretty wicked with his bow and arrows! Let’s go back to Magnus; you can never have enough Magnus! City of Lost Souls keeps making all these references to Magnus's father, and now I'm interested. Who is Magnus's father? I have some theories, but in the end I don't know! Uggh, Magnus needs his own spinoff! Let's move on to Clary. Clary, Clary, Clary, oh how you annoy me at times. It's not that I hate Clary; it’s just that I find her too headstrong and reckless. I also think she is kind of selfish. In the process of getting what she wants, her friends sometimes get hurt. I can, however, respect her for her fighting skills and her determination and loyalty. I wouldn't be lying if I said I would want her on my side of the fight. Let's get to the good stuff: the Infernal Devices clues/references! I flipped out whenever I thought something referenced those guys! I slammed the book, I squealed, I laughed. It was amazing! I want Clockwork Princess! I won't give away any of the good stuff, but let me tell you, I was shooting out theories like there was no tomorrow. Lee and I were trying to piece together the ending of The Infernal Devices. We have some pretty farfetched theories, but let me tell you, reading the epic series, A Song of Ice and Fire, teaches you things, things which Lee and I have picked up and are putting to good use. The Silent Brother, Zachariah, is sketchy! And that is all I'm going to say on that topic . . . for now. Anyway, I really, really loved this book! It was amazing and leaves readers wanting more! So my advice: read it! And if you have read all the Mortal Instruments books, then get to reading The Infernal Devices! But, if you are like Lee and me and have already read all of these amazing, life-changing books, then I am sorry, but you’re going to have to wait! At least we have our theories . . . . I know, small comfort. But I'm really glad Cassandra Clare decided to write these books. I can't imagine life without them, sniffle, sniffle. All in All: I am a proud owner of my own copy, courtesy of Lee, and recommend this book to anybody and everybody. Just go read it! Lee's Review: I’m going to try to keep this review somewhat sane in length, but when it comes to Cassandra Clare’s books, I just don’t know when to shut up. Please forgive me in advance for the amount of blathering that’s about to go down here. I LOVED this book. As much as I enjoyed most of the previous Mortal Instruments books, City of Lost Souls just hit all the right notes for me. Reading about these characters again was like meeting up with an old friend you hadn’t seen in years. It was so easy to fall right back into the story. I wasn’t crazy over the last installment, City of Fallen Angels, mostly because I couldn’t stand Jace’s moping. It drove me insane. Yes, there was a very important, plot-related reason for it, but I still didn’t like it. And yes, I’m heavily invested in Jace's well-being; I have to remind myself constantly that he's fictional. We still don’t have the real Jace here, but this version is a huge improvement over the one from CoFA. I feel like City of Lost Souls should have been Book Four, or at least some elements should have been in City of Fallen Angels. The build-up to the confrontation with Lilith in the latter took forever. I probably would have liked CoFA more if its pacing had been better. Multiple characters, including Alec, Isabelle, Jordan, and Jocelyn, have points-of-view in this book. Things could have spiraled out of control very easily, but Clare juggles all of them adeptly. I really liked Alec and Isabelle’s POVs; I was glad to see them step into the spotlight a bit more. Alec’s POV was especially welcome because it meant more pages with Magnus in them! Sebastian is truly the type of villain that you love to hate. His warped, sadistic mind makes it very easy to despise him. Yet there were a few moments in this book when I almost believed that maybe he was slightly less evil than I’d originally thought. Not only does he play games with the characters in the book, but he also toys with readers by keeping them guessing as to what his true face looks like, if he even has one. This review wouldn’t be complete without mentioning our heroine, Clary. I’ve never been a big Clary fan because of her propensity to act first and think about the consequences later. I’ve always thought that Isabelle would have made a better protagonist for the series. In this book, though, Clary finally seems to realize what being a Shadowhunter is all about. She shows off some pretty mean fighting skills, and at one crucial point in the story, she reflects on a particular rash decision that she made and learns from it. Please continue in this direction, Clary; we might become friends yet. All in All: Five stars all the way! It’s going to be a very long wait until 2014, when City of Heavenly Fire gets released.